The Elmo TT-O2RX Document Camera features true color reproduction, 30-frames-per-second real-time image, New Image Mate software with audio and video recording, and 5.2x optical zoom. The high frame-per-second rate allows teachers to display full-motion video—something not possible with many document cameras. The document’s large shooting area (11"x17") makes it useful for graphing in math and showing artwork and documents in social studies and language arts classes. The microscope function is handy not only in science class; for example, it could be used in social studies to examine small relics. Pros: There is 41.6x zoom available (5.2x optical, 8.0x digital), and the control panel is logically designed, with simplified buttons. The LED makes operation easy and intuitive. There are online lessons available and an onboard SD memory card, and at 30 frames per second, you can easily capture live motion. The microscope mode displays minuscule matter, and the camera can display documents of up to 11"x17". Removable stage[AT1] <#_msocom_1> . 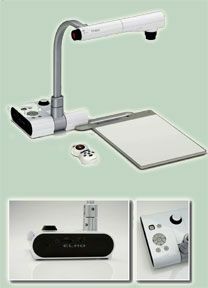 Overall evaluation: This is good document camera; the best feature is the high frame-per-second rate, which is not found in many more-expensive cameras.